Definition: A cable used for the transmission and distribution of electrical energy is called electrical power cable. 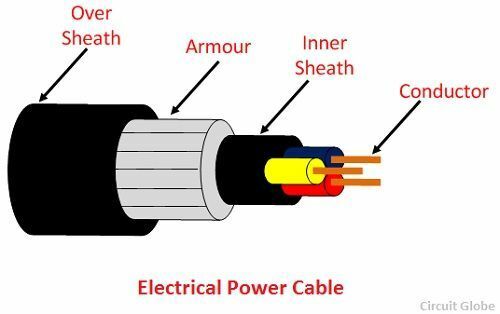 Power cable consists two or more electrical conductors join with an over sheath. It is used for the transmission of extra high voltages in a place where overhead lines are impracticable to use like, the sea, airfield crossing, etc. But underground cable is more costly as compared to aerial cable for the same voltage which is one of the main draws back of electrical power cable. The power cable mainly consists of three main components, namely, conductor, dielectric, and sheath.The conductor in the cable provides the conducting path for the current. The insulation or dielectric withstands the service voltage and isolates the conductor with other objects. The sheath does not allow the moistures to enter and protects the cables from all external influences like chemical or electrochemical attack, fire, etc. The main components of electrical power cables are explained below in details. Coppers and aluminum wires are used as a conductor material in cables because of their high electrical conductivity. Solid or number of bare wires made of either copper or aluminum are used to make a power cable. For a conductor having more than three wires, the wire is arranged around a center wire such that there are six in the first layer, twelve in the second, eighteen in the third, and so on. The number of wires in the conductors are 7, 19, 37, 61, 91, etc., The size of the conductor is represented by 7/A, 19/B, 37/C, etc., in which first figures represent the number of strands and the second figure A, B, C, etc., represents the diameters in cm or mm of the individual wire of the conductors. The most commonly used dielectric in power cables is impregnated paper, butyl rubber, polyvinyl chloride cable, polyethylene, cross-linked polyethylene. Paper insulated cables are mostly preferred because their current carrying capacity is high, generally reliable and having a long life. The dielectric compound used for the cable should have following properties. The insulator must have high insulation resistance. It should have high dielectric strength so that it does not allow the leakage current to pass through it. The material must have good mechanical strength. The dielectric material should be capable of operating at high temperature. It should have low thermal resistance. It should have a low power factor. The cables used for submarine and damp soil should use synthetic dielectrics like polyvinyl chloride, polyethylene, etc. These materials are comparatively lighter and have nonmigratory dielectric. Also, such type of dielectric material has good dielectric strength, low power loss, and low thermal resistance. It is used for protecting the cable from moistures which would affect the insulation. Cable sheath is made up of lead alloy, and these strengths withstand the internal pressures of the pressurized cables. The material used for inner sheath should be nonmagnetic material. The aluminum sheath is also used in a power cable because it is cheaper, smaller in weight and high mechanical strength than the lead sheath. In oil-filled cables and telephone, cables corrugated seamless aluminum sheath is used because it has better-bending properties, reduced thickness, and lesser weight. Lead sheath cables when directly laid down on the ground are damaged by corrosion and electrolyte. For protecting the cables against corrosion layers of fibrous material like paper, hessian, etc., or polyvinyl chloride is used. Layers of fibrous material spread with the waterproof compound to the outside of the electrical cable are called serving. Armouring: Armouring is the process in which layers of galvanized steel wires or two layers of metal tape are applied over sheath for protecting it from mechanical damage.The steel wires are normally used for armouring because it has high longitudinal strength. Armouring is also used for earthing the cable. When the fault occurs in the cable (due to insulation failure) the fault current flows through the armour and get earthed. It gives the mechanical strength to the cables. It protects the cable from overall damage like moisture, corrosion, dirt, dust, etc. The thermosetting or thermoplastic material is used for making over the sheath.